As I mentioned a long time ago, I have a special set of headphones for lawn mowing that has a radio built in to them. Well, the unit has a stubby little antenna that only pulls in two stations reliably from every corner of the yard: 92.9 and 105.1. Back in the early days of Nogglestead, 92.9 was a country station. As it had the strongest signal, I listened to it captively while mowing my acreage, which takes four or so hours per mowing. Then 92.9 changed formats and became The Beat and switched to a hiphoppish pop. So I started listening to 105.1 which has a slightly lesser signal, but it was classicish country, with songs from the 1980s mixed with some more recent stuff. But this last year, 105.1 has changed to all bro country music. Earlier this summer, I thought, Man, pop songs can’t be worse than bro country, so I switched to 92.9 for a couple of songs. 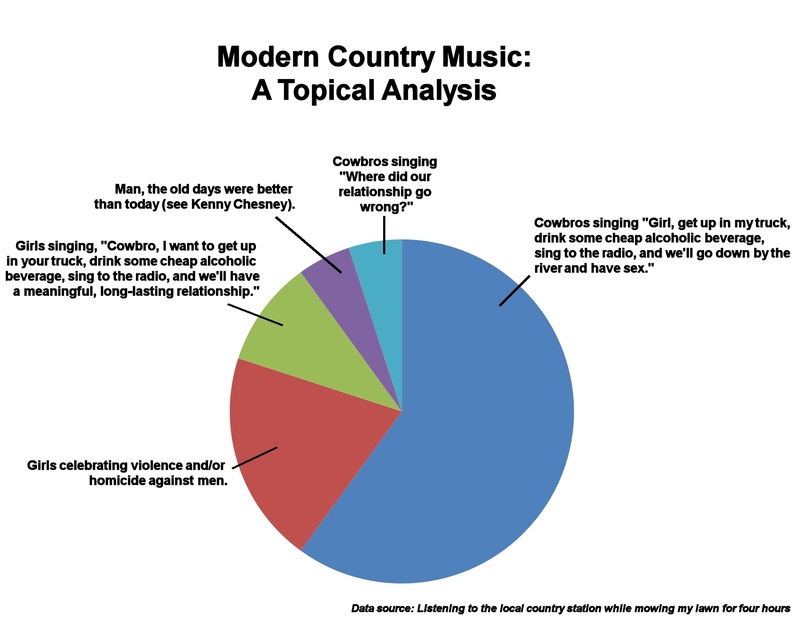 Which were like bro country with less musical artistry, more autotune, and more celebration illegal drug use. And the topic matters were almost the same. So I switched back to 105.1. I’m glad it’s coming to the end of the summer. I’m not sure how much more I can take of bro country. One genre continues to address these concerns: country music’s sales increased 12% last year. I suspect Big Music doesn’t know why, but probably assumes a nineteen-year-old navel-baring singer could make next year the best yet. How prescient that seems now that a decade and almost half have passed, and country music, or at least country music radio, is aimed squarely at the 20-year-old party crowd. Bro country stations are those in which Johnny Cash, Merle Haggard or Hank Williams can be name-checked in a song but never actually played in the rotation.